After living here for just over ten years, I’m still learning about Los Angeles and its surprisingly rich history. From the 1950s and into the mid-’60s, local station KTLA, then owned by Paramount, ran The Pier Point 5 Club, later renamed The Popeye Show. Both shows aired live segments between episodes of the Popeye cartoon, which had been licensed to Paramount in 1941. To compete with other children’s programming, KTLA needed a host for the live segments, and so they hired Tom Hatten. Dressed as a skipper to resemble Popeye, what made Tom Hatten unique from the other kids show hosts was his abilities as an artist, in addition to being a classically trained actor. 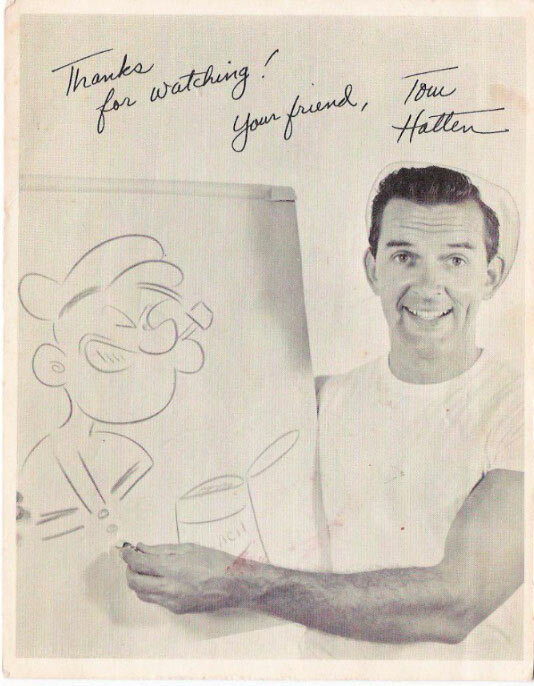 Tom Hatten would draw Popeye, Olive Oyl and Bluto live on the show. For many LA area kids, this was probably the first time they’d ever seen someone draw seemingly random lines on a page and bring them together to create something familiar. The show was so popular that it was brought back in the ’70s and ’80s. That magical experience was expanded when Tom Hatten started holding contests on the show where random “squiggle” as he would call them, would be made by a local kid, and then he would turn it into a whale or funny looking character. If he couldn’t turn the squiggle into something, the kid would win a free bike. This kind of local programming is unheard of these days, so naturally this kind of improvised drawing is almost impossible to find. Fortunately I know of one live performance happening this week that is an absolute joy to watch. At Comic-Con International: San Diego, one my favorite panels is Quick Draw, where master cartoonists Sergio Aragonés (Groo the Wanderer, Mad Magazine) and Scott Shaw! (Captain Carrot & His Amazing Zoo Crew, Simpsons Comics) improvise their way through a flurry of cartoon drawings. This year they’ll be joined by cartoonist Mike Kazaleh (The Adventures of Captain Jack, Futurama). The show is hosted by comics historian/animation director Mark Evanier and there are usually some guest appearances by popular comics creators. It’s a hilarious hour and change, and really shows just how brilliant these people are to be able to create identifiable objects with personality and style using free association and random audience suggestions. But back to Tom Hatten. Unfortunately I couldn’t find any videos on YouTube of Tom drawing from the original show itself, but I found a bunch of gift ideas for 8 year old boys and this two-part interview from 2004 where he was a guest on the local talk show Marty’s Corner. He demonstrated the squiggles game and his drawing Olive Oyl to get the job, along with other great anecdotes. I was one of the contestants on Tom Hatten’s Popeye show at the KTLA studio in 1960. Still have my picture to prove it. And I did win the squiggle contest! Sorry, didn’t win a bike! The weekly prize at that time was a “Break-your- Neck” Trampoline. Didn’t win it! I was a contestant as well in1957…I drew Groucho Marx and won a huge box of assorted candy bars and a red scooter. Tom Hatten drew charcoal pictures of both my brothers and me. I became an artist and was telling friends that Tom Hatten used to come to my elementary school and draw cartoons from an alphabet or scribble, I googled Tom and there you were! Thanks for the memories! I was on the show in 1964 along with 3 friends imitating The Beatles. It was an early form of Kareoke. KTLA was giving away tickets to the concert at the Hollywood Bowl. I found this today and loved it. I totally remember Tom Hatten when I was growing up and I loved his drawing on tv. I do lettering and illustration and love the old vintage animation. I’m sure Tom Hatten was a childhood inspiration!! Good memories, but Tom Hatten dressed as an ordinary sailor in a white tee shirt and sailor hat. You’re confusing him with “Skipper Frank” Herman, another cartoon show host who was also on KYLA Channel 5. The other members of the big four were “Engineer Bill” Stulla (KHJ Channel 9) and “Sheriff John” Rovick (KTTV Chanel 11). Living in La Puente for over 50 years…..I remember taking my kids to Merritt’s Hardware on Hacienda in the 60’s to meet and greet with Tom Hatten. I was told he was personal friends with the store owner, Merritt Brenner. Tom Hatten came to our school carnival in the later 1950’s and was the main show. He called several of us to the stage to sketch us. Ive lost my picture wearing a straw hat but Ive never forgotten the experience. I watched Popeye with Mr. Hatton every weekend with my father as a kid. We loved it. I was reminded of this by a friend of mine recently. It brought back a wonderful memory of being on the Popeye show with Tom Hatten. I drew a box kite with the squiggle I was assigned and I won for the day. Then in a contest for the weekly prize I also won a trampoline! Today I am in illustrator and Art teacher. I think that experience really influenced me. I was on The Popeye Show with Tom Hatten when I was 9, back in 1975 or 76… it was very exciting and I still have my drawing also. I didn’t win though. I think my classmates were as excited about it was I was. I loved Tom Hatten and Popeye. My favorite TV show ever. Tom Hatten was so cute, and those dimples! Swoon. I must have been about 5 when I started watching, but I never missed the show. Broke this former kid’s heart, he did, right then and there. I’m 66 now and I suppose there’s a chance I might get over it. Someday. Hey Tom, just made a post on Facebook about you being my namesake. I shared your Caldwell High School graduation picture and the picture from “Spies Like Us”.Many people are responding to my post and I urged them to Google you. I am so honored to be named after you. I know you and dad were close. I retired 8 months ago and my wife Shannon retired a week ago today. We have 3 boys and a girl, all happily married with 20 grandkids total. I tell people we outdid my folks, they had 20 grankids, but had 5 kids, where I only hav 4. Would love to hear from you. In my opinion you are a legend from Caldwell High. I really wish I had some of the drawings you did for us kids when you visited us. God bless! Tom Hatten was my absolutely favorite show to faithfully watch. I too was on his show. I didn’t win anything but was so thrilled to be there and got to meet him. He gave me a peek on my cheek. I followed him through many of his tv and movie appearances and was a fan of the Family Film Festival. He was a great, positive influence on my life and I still eat spinach to this day. I was reminiscing with my adult children the other day and told them of my favorite show and personality. Thank you Mr. Hatten. Judging from the other messages, you remain loved.